Live Charts now features a buzzing online day trading community with the addition of our unique day trading message board. You can join up for free and find one of the webs most friendly and informative day trading message boards. We have day trading chat threads on the Dow Jones and US Markets, the FTSE 100 and European Markets, Crude Oil and Forex trading chat plus lots of other useful trading strategy and housing market chat. Our user base is from all over the globe with regular members popping in from the USA to Australia and from Europe to Asia. 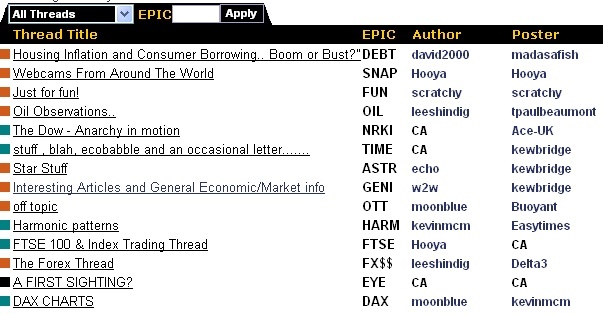 The day trading chat threads are produced in a very easy to follow format which are quite unique. It allows for very fast chat at busy market times and also the ability to create threads with decorative headers which stay at the top of every chat. Allowing day traders to add charts and information to personalize their own trading chat threads. See our screen shot below of our basic Trading Community Home Page.. Please be aware you use this message board at your own risk, Live Charts UK and anyone directly involved with the company cannot be held responsible for views posted upon them. We will try to keep the threads free from foul language and abusive posts by way of moderation, but all other posts are the opinion of the poster only and should not be treated as advice from Live Charts, or be viewed as 100% truthful. What is Spot Gold Price?